Two darling quilts make a splash in this Pattern Duo. Picnic Basket Zest 66" x 66"
Retro inspired gingham baskets and contemporary angles are blended in this zesty design. The baskets are garnished with appliques harvested from the focal fabric. Make a splash at your next picnic with this charming quilt. For the intermediate quilter. 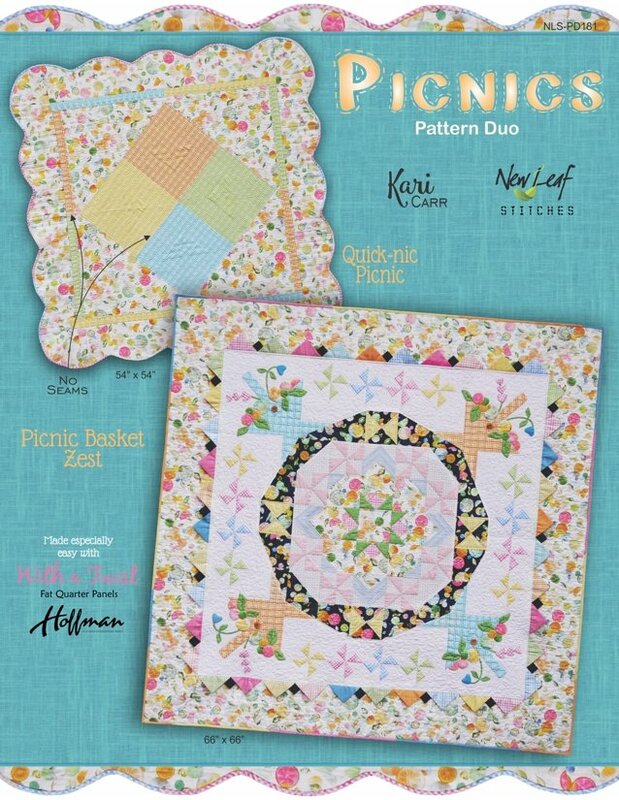 Quick-Nic Picnic 54" x 54"
A charming quilt that takes advantage of the engineered layout of the gingham panel from "With a Twist" Designer Bolt. The four-patch center is created with inventive cutting - meaning there are no seams! (of course, you can make it with traditional fat quarters as well). Scalloped edges and bias gingham binding are adorable touches.